Director – Fritz Lang, Screenplay – Fritz Lang & Thea Von Harbou, Photography (b&w) – Erich Nietzschmann, Herman Salfrank & Fritz Arno Wagner, Production Design – Robert Herlth, Walter Rohrig & Herman Warm. Production Company – Decla-Bioscop. A woman’s lover mysteriously vanishes. Searching for him, she sees his spirit vanishing into a vast wall with no entrance that is built next to the cemetery. In the Bible, she reads that ‘love is stronger than death’ and so goes to Death to beg for her lover’s life. Death gives her an opportunity to save her lover’s life, reincarnating the two of them in three different periods of history – he as an infidel on the run in Ancient Baghdad; as an Italian Renaissance nobleman hunted by an assassin; and as a magician’s apprentice on the run from the Emperor’s guard in Imperial China. Destiny is one of the earliest silent films from the great Fritz Lang who would go onto make classics such as Dr Mabuse, The Gambler (1922), Siegfried (1924), Metropolis (1927), Woman in the Moon (1929) and M (1931). Destiny is an interesting effort, although is one of the lesser known among Lang’s films. It is not quite up there with the visual extravagance of Lang films like Metropolis or the dramatic intensity of later Lang thrillers like Dr Mabuse, M and Lang’s underworld films. It is however by no means uninteresting. 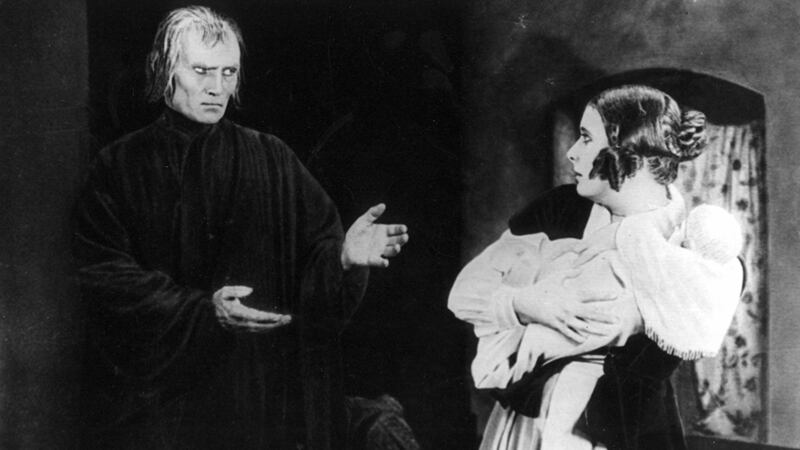 Fritz Lang draws upon a mythic Mediaeval/Gothic worldview. The film is not so much a morality as it is a mortality play; one where aspects take on literal form – a personalised Death and where love is an absolute force that can conquer Death. Lang was clearly influenced by the multi-period historical tapestry of D.W. Griffith’s epic Intolerance (1916) from which he borrows Griffith’s idea of multiple stories, each taking place in different historical eras. Unfortunately, Lang does not have the facilities at his disposal to create the epic sweep that Griffith did – the sets are often too cut-priced to offer a full historical pageant. Moreover, the stories are variably effective – the final segment’s tone of burlesque varies wildly in style from the serious mood sustained in the other episodes or even the wraparound. Certainly, Fritz Lang’s images are impressive – the parade of double-exposed spirits passing through the giant wall; the masked Giovanfransesco’s arrival by underground gondola; some of the magician’s tricks including producing miniature armies out of a box and a horse that rides across the sky; and especially the scene where Death takes Lil Dagover to a room where he shows her an array of lit candles, each representing a single life. Frumpy Lil Dagover is too dull to play the part of the wistful 19th Century Romantic heroine. On the other hand, Bernhard Goetzke impresses as a gaunt and stony but strangely sympathetic Death. Fritz Lang’s other films of genre interest are:– Dr Mabuse, The Gambler (1922) concerning a ruthless criminal mastermind; the two-part Niebelungen saga, Siegfried (1924) and Kriemhild’s Revenge (1924), based on the Teutonic myths; Metropolis (1927); Woman in the Moon (1929), a realistic attempt to portary a Moon landing; M (1931), a thriller concerning the hunt for a child killer; The Testament of Dr Mabuse (1933); the afterlife fantasy Liliom (1933); the film noir psycho-thriller Secret Beyond the Door (1948); and a further Dr Mabuse sequel The 1000 Eyes of Dr. Mabuse (1960).